Hi! 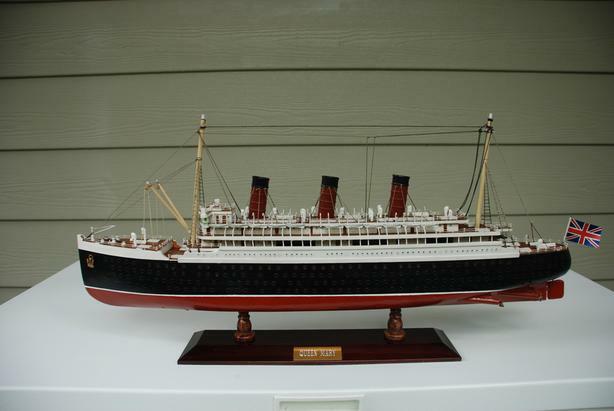 I have for sale a hand-made replica model (not a kit) of the Queen Mary Cunard Line ocean liner. It is made primarily of wood and metal painted with detailed embellishments such as rope ladders and a cloth flag. There are no decals used on the making of this model. The dimensions are (including the stand) 25.5"L x 3.5"W x 12.25"H: the stand alone is about 3" high. I am selling this Queen Mary replica for a friend of mine who is down-sizing. It was purchased at Jordan's Home Interiors in Vancouver ten years ago: the initial price was $1,500 but my friend got this replica for half price ($750) because of his large furniture purchase at the time. Today, Jordan's is selling a similar model of the Titanic for $1,920.00. I am asking $200 for this replica. I am located in Vancouver, BC but shipping is no problem. I will be happy to mail this Queen Mary replica to you using CanadaPost and Interac bank transfer. So, if you are interested in purchasing, e-mail me and we'll figure out the logistics and/or I can answer any questions you may have.